'I'd only wear a onesie at home' Jump to media player In the first of his radio phone-ins Deputy Prime Minister Nick Clegg was asked if he was truly a man of the people by wearing a onesie. Onesie: Great gift or fashion crime? Jump to media player Newsnight's Stephen Smith reports on the appeal of the ''onesie'' - a comfortable one-piece for grown-ups which is reportedly seeing a big increase in sales in the lead-up to Christmas. 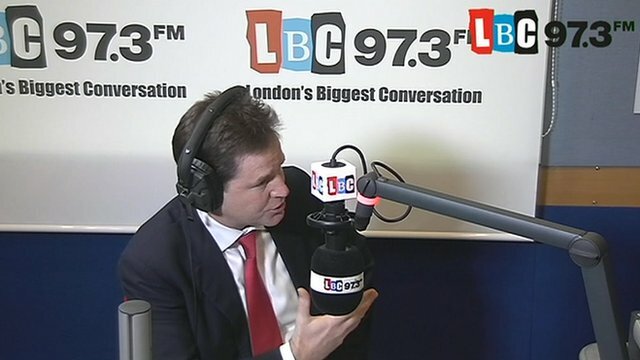 Deputy Prime Minister Nick Clegg has held the first of his new weekly radio phone-ins as he seeks to reconnect with voters. The Liberal Democrat leader took calls from listeners to London's LBC radio station with presenter Nick Ferrari at 9am on Thursday morning. 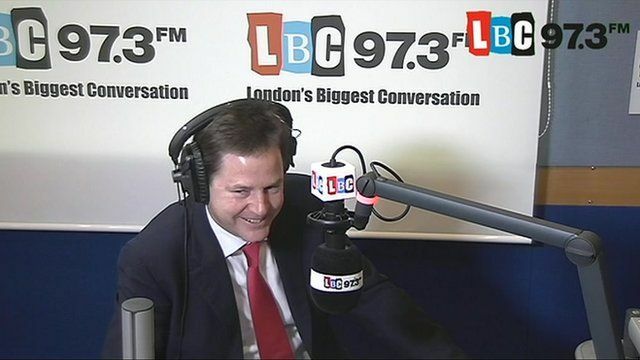 One caller asked if Mr Clegg was truly a man of the people by ever wearing a onesie. Go to next video: Onesie: Great gift or fashion crime?